On July 11, 2006 when the 31-year-old Mahendra Pitav boarded his usual train home, he had no idea his world would turn upside down in a split of a second. A daily journey that he had been making for years would be the reason that his life may change forever. Pitav was one of the survivors of the 2006 Mumbai Train Bomb Blasts that killed 200 people and nearly injured 700 commuters. He lost his left arm in the tragedy. Almost 12 years later, Pitav is a consultant for Maker’s Asylum’s second S.T.E.A.M series program (an initiative devised to encourage people to use their tech and design skills to solve ‘global sustainability challenges with local perspective) called Fabrikarium. The 5-day program held from Feb 10- Feb 14 focused on creating customized Bionic hands, low cost wheelchairs and braille printers with differently-abled people. S.T.E.A.M is an acronym for Science, Technology, Electronics, Art and Math, and people from all skill backgrounds applied to this programme. Started by Maker’s Asylum in conjunction with Bonjour India, an Indo-French partnership whose goal is to ‘incubate dreams, ideas and projects moving the partnership between both countries into the future, they geared up for the Fabrikarium in collaboration with My Human Kit in France. Held under the umbrella of Bonjour India 2017 - 2018, the workshop hosted about 65 participants (including differently abled people) and 20 mentors from India and France. Pitav confidently sports a basic bionic hand, but says that its functions are limited. A more advanced version enabling more operations will certainly burn a hole in his pocket, thus he is working with various engineers, designers and scientists at the workshop to devise a low cost multi-functional bionic arm that would ease not just him, but hundreds of others who are unable to do daily life tasks just because of having lost an arm. “This bionic arm that I wear does not let me identify the temperature. Moreover the pressure you hold a plastic container as compared to a glass container is different, which I can’t sense with this arm. I am also a biker and it is hard to maneuver my phone while I am riding. These people here are working with sensors and micro-controllers and are also attaching a phone holder,” he exclaims sounding visibly relieved. Sahal Hashim, the 24-year-old Robotic Engineer working on the bionic arm explains the science behind it. “The micro controller gets an input from a customized IR sensor attached to the muscles on the arm that determine the movement of the fingers. Also sensors like FSR and temperature are added to get a feedback on the amount of pressure put on while holding the object and to identify the temperature of object which is reflected as a coloured light on the arm.” As great minds work meticulously to make the final fittings on the bionic arm, another team works to determine its cost. “Only INR 20,000”, a team member says, a dramatic difference between the ones available in the market, which costs anywhere between INR 6,00,000-8,00,000. The Bionic Arms Team has many sub-teams each that worked on various parts, from making a comfortable socket to making ‘funny hands’ for various operations such as playing the guitar to swirling the racket around to kill mosquitoes. Just besides this workstation, another great invention is in the making. ‘Fla’ir’ or the flying wheelchair for the differently-abled to para glide. The mentor is Avi Malik, Chief Flying Instructor at the paragliding school in Kamshet, for whom this has been an impending dream. “They may not be able to walk, but they can fly with this chair,” he says ambitiously. 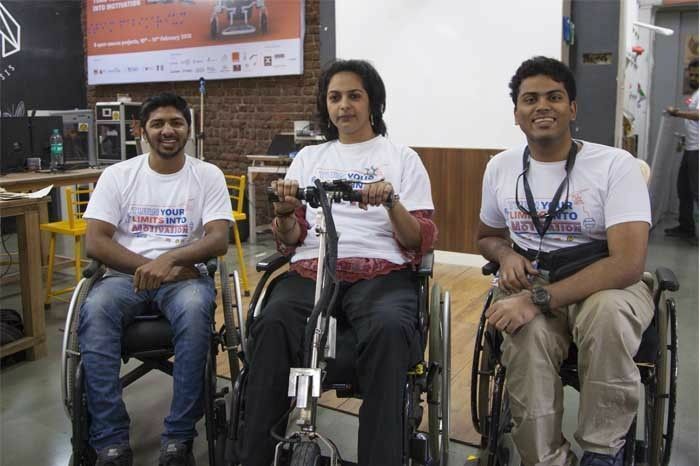 “The flying wheelchair, which would be extremely light weight with a special kind of harness would be the first of its kind project in India, wherein we would be enabling them to not just fly with an instructor but also training them to fly solo. It costs about $ 5000 abroad, but here the cost of production has been only INR 20,000,” he adds pointing to the chair which is being welded for final fittings. It would be tested in the coming week. Another really cool wheelchair innovation happening at the Fabrikarium is the automatic wheelchair which is basically a manual wheelchair being fitted with a scooter engine at the back. “This way we are not only cutting the cost, but also creating the wheelchair that would operate both manually and automatically,” a spokesperson from the team tells us. As the cool motor wheelchair is ready, Ajay Salwa and Dhruv George who are both wheel chair users, providing this team with consultation about comfort, access and mobility race against each other on it. Cheers and hoots echo in the room as the wheelchairs zoom past each other. After many trials and errors, the motor wheelchair is finally a success. 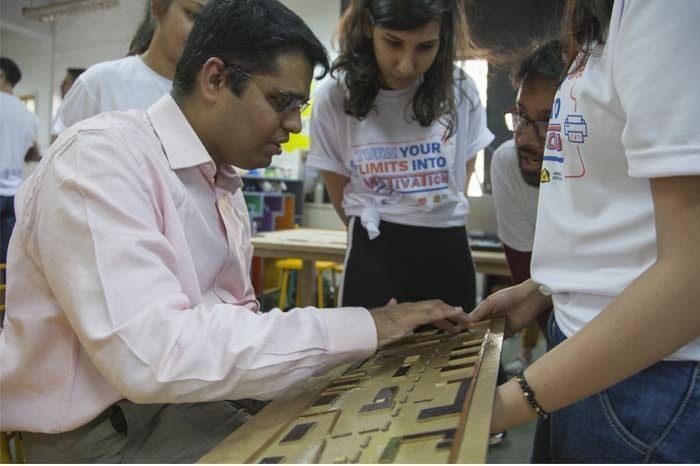 A group of designers and engineers are working on the 3D Braille printers which would be effective for the visually impaired to read signboards. Throughout the room, there are symbols and sign boards for various workstations, washrooms etc. that also have the braille version inscribed on them. Arthur from My Human Kit is the mentor for the team working on this project. He shows me the various prototypes and samples that they have created so far. “This for the laser cutting workstation, this is for the washroom he says pointing at two different cards. Let’s hope they do not get exchanged,” he chuckles. Maker’s Asylum, Mumbai is all about harnessing the diverse knowledge of India and channeling it into visible, effective social change. To further this goal in this workshop the S.T.E.A.M school invited many experts on the last day of the programme to come interact with various teams, provide them with feedback and ideas to market these innovations so they can serve their purpose effectively. The programme also saw an expert panel talk and concluded with a jamming session wherein Nico from My Human Kit, France played the drums and the guitar with newly designed bionic arm, the incident that showed that all the efforts put in were indeed fruitful. 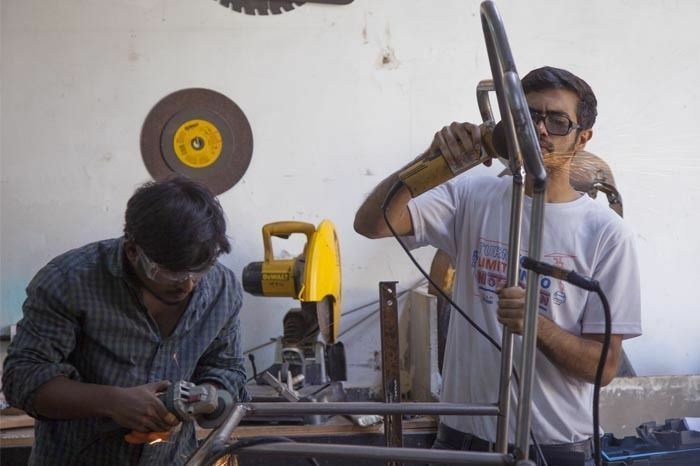 As Maker’s Assylum’s STEAM School are using the collective pool of talent and expertise of engineers, designers, artists, doctors, documentation specialists to tackle some of India’s greatest social challenges, on the forefront being empowering the differently abled by mechanizing cost effective tools for them, they are bringing the advantages of technology and design to those who need it most. All photographs by Rashi Arora.